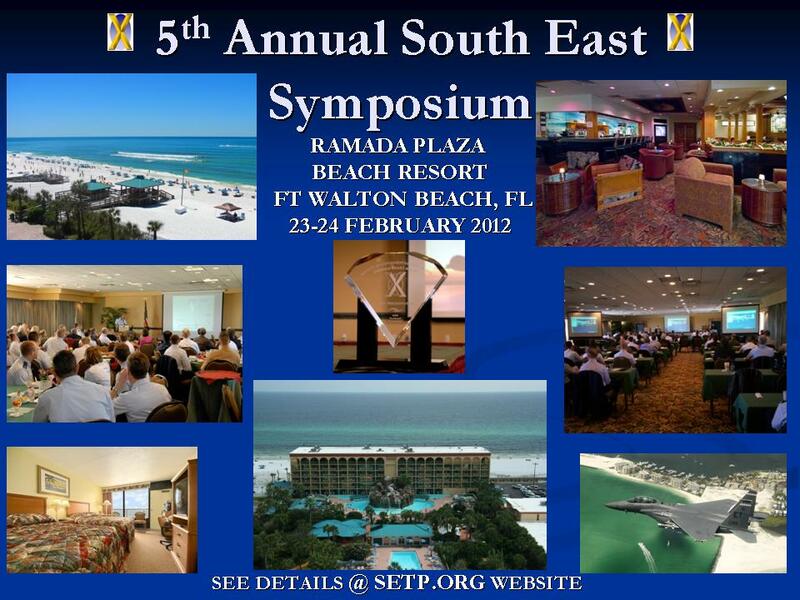 The Society of Experimental Test Pilots is pleased to announce that the 5th Annual Southeast Section Symposium will be held on 23-24 February 2012 at the Ramada Plaza Beach Resort, 1500 Miracle Strip Parkway SE, Fort Walton Beach, FL. Troy Fontaine (M) is the Chairman for this event. A limited block of rooms has been reserved at the government rate of $78 at the Ramada Plaza Beach Resort. This rate will be honored until 3 February. Reservations may be made by calling 1-800-874-8962. When calling, please mention that you are attending the Society of Experimental Test Pilots symposium to receive the negotiated rate. The Ramada Plaza Hotel has provided a block of rooms at the government per diem rate of $78 single/double. You may make your by calling -800-874-8962. Please mention you are attending the Society of Experimental Test Pilots Southeast Symposium to receive the group rate. YOUR RESERVATION MUST BE RECEIVED BY FRIDAY, 3 FEBRUARY IN ORDER TO GUARANTEE A ROOM AT THE SPECIAL RATE. Reservations may be made after that date based on availability.